Researchers are working to understand how often-colorless biological nanostructures give rise to some of the most spectacular technicolor displays in nature. Colors may be evolution’s most beautiful accident. Spontaneous mutations that perturbed the arrangement of structural components, such as cellulose, collagen, chitin, and keratin, inadvertently created nanoscale landscapes that catch light in the most vibrantly diverse ways—producing iridescent greens, fiery reds, brilliant blues, opalescent whites, glossy silvers, and ebony blacks. Structural colors, in contrast to those produced by pigments or dyes, arise from the physical interaction of light with biological nanostructures. These color-creating structures likely developed as an important phenotype during the Cambrian explosion more than 500 million years ago, when organisms developed the first eyes and the ability to detect light, color, shade, and contrast. “As soon as you had visual predators, there were organisms that were either trying to distract, avoid, or communicate with those predators using structural coloration,” says Yale University evolutionary ornithologist Richard Prum. AGELESS BRILLIANCE: Although the pigment-derived leaf color of this decades-old specimen of the African perennial Pollia condensata has faded, the fruit still maintains its intense metallic-blue iridescence.COURTESY OF P.J. RUDALLEver since, structural coloration has evolved multiple times across the tree of life, as a wide range of organisms developed ways to fine-tune the geometry of some of the most abundant (and often colorless) biomaterials on Earth, engineering grooves, pockets, and films that scatter light waves and cause them to interfere with each other in ways we humans happen to find aesthetically pleasing. PIXELATED COLORS: Optical microscope image of the Pollia condensata fruit under epi-illumination. Below: Transmission electron micrograph (TEM) showing the cellulose microfibrils within a thick-walled cell of the fruit's outermost cell layer that give rise to the berries’ color.COURTESY OF SILVIA VIGNOLINIFor centuries, scientists have studied the minute structures that give peacock feathers, butterfly wings, and beetle carapaces their striking iridescence, but “nothing really compares to the interest we’ve seen in these species over the last 10 or 12 years,” says physicist Peter Vukusic, a professor of natural photonics at the University of Exeter in the United Kingdom. The recent interest stems from the birth of synthetic photonics—a field that aims to create materials that precisely control the flow of light and color through structure. 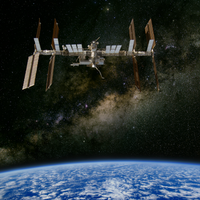 Begun in the late 1980s and early 1990s, synthetic photonics has given rise to ubiquitous technologies such as Blu-ray and to major technological advances in telecommunications. 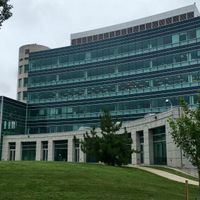 “But if you look at a colorful butterfly, or beetle, or fish, or bird, you see these structures that have been doing a similar job for such a long time,” Vukusic says. Pigments and dyes are molecules that produce colors by the selective absorption and reflection of specific wavelengths of electromagnetic radiation. Structural colors, on the other hand, rely exclusively on the shape of the material and not its chemical properties. While pigments and dyes degrade and their colors fade over time, some types of structural coloration, which rely on the same materials that make up tree bark, insect exoskeletons, and claws or nails, can persist hundreds, thousands, and even millions of years after the death of the organism. 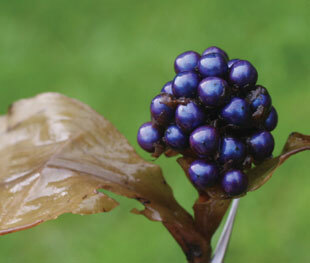 At London’s Royal Botanic Gardens, Kew, the berrylike fruits of the African perennial herb Pollia condensata, still shine an intensely bright metallic blue despite having been collected more than 4 decades ago. When the specimens came to the attention of Silvia Vignolini, a physics postdoc at the University of Cambridge, she set out to understand how exactly the fruit produced its intense, iridescent color. “It was weird that the fruit would produce a color that wouldn’t fade in many, many years,” Vignolini says. “Some of the plants we studied were collected almost 100 years ago.” Vignolini and her colleagues were unable to extract any blue pigment from the Pollia fruits. But when they were examined by transmission and scanning electron microscopes, the researchers found that the fruits’ long-lasting blue iridescence was generated by the outermost layers of thick-walled cells. COURTESY OF SILVIA VIGNOLINISpecifically, within the walls of those cells are layers of cellulose microfibrils, stacked in a manner resembling a helix—each layer slightly rotated with respect to the next. (See photomicrograph here.) Within each cell wall are many such helicoids stacked one on top of another. The distance between two similar points in a given helix—a value known as the helical pitch—is about the same as the wavelength of blue light. As a result, blue light is selectively reflected while other color wavelengths pass through or get canceled out through a property called constructive interference. 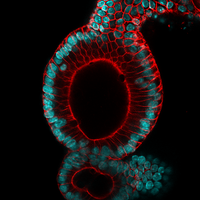 However, the spacing of the cellulose layers varies slightly from cell to cell, with a minority of cells giving off red, purple, and green hues, thus giving the fruit a pixelated appearance when viewed under a certain type of illumination. These cellulose structures are also highly reflective, sending back approximately 30 percent of incoming light—garnering the Pollia condensata fruit the distinction of being the brightest living object on land. What’s more, Vignolini and her colleagues found that the geometry of the cellulose helicoids can circularly polarize light—meaning that they can introduce a rotation in the electrical field vector of light, which is naturally unpolarized. “Circular polarization of light by natural structures isn’t unique,” explains Beverley Glover, an evolutionary botanist at the University of Cambridge who also took part in the Pollia study. But what’s unique about the African berry is that cells can produce both left-handed and right-handed circular polarized light, depending on the “handedness” or orientation of the cellulose helicoids. “We don’t know of any other plant tissue that lays down helicoids in both directions,” Glover says. The brightness and the circular polarization of light may help the Pollia plant make its fruit more visible to birds and other animals, which in turn may be more inclined to pick up the shiny spheres and help disperse the seeds encased in each fruit. Research on bee foraging behavior carried out by Glover suggests that iridescence can help pollinators hone in on plants more quickly because the colors change depending on the angle of observation. “It’s flashing as you approach it, so it’s more striking,” says Glover. Although there are only a handful of known examples of structural colors in fruits, there are plenty to be found in the leaves and petals of plants. Within every family of flowering plants, there is at least one species that displays structural colors. “The presence of structural colors, especially in flowers, is likely used by pollinators to spot the position of the flower and to recognize it better,” Vignolini explains. But in some plants, the evolutionary purpose of structural coloration is harder to pin down. 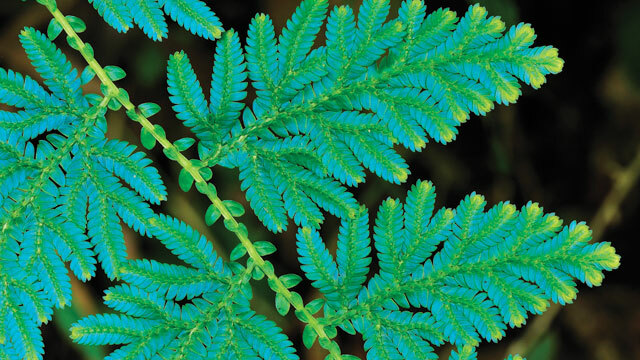 The leaves of the low-lying tropical spikemoss Selaginella willdenowii, for example, produce blue-green iridescence when young and growing in the shade, and tend to lose the structural coloration with age and when exposed to high levels of light. 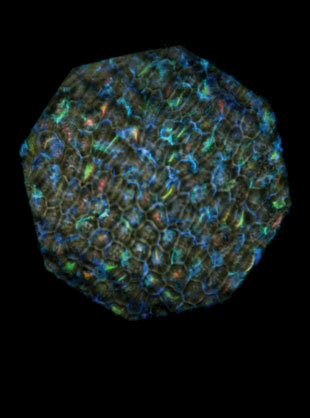 The iridescence is achieved by cells in the leaves’ upper epidermis, which contain a few layers of cellulose microfibrils packed with different amounts of water. This ultrastructure is often absent in the leaves of the same species growing in direct sunlight. Researchers hypothesize that the spikemoss turns off its iridescence by changing the water content of the leaves’ cell walls, says Heather Whitney, a research fellow at the University of Bristol who studies iridescence in plants. Within every family of flowering plants, there is at least one species that displays structural colors. One theory for why some S. willdenowii leaves produce these extra cellulose layers is that the interference of light created by the blue-green iridescence helps optimize photosynthesis. “It could be that there is a physiological function for making an optical nanostructure that will scatter blue light back into the chloroplast efficiently that has nothing to do with producing a color,” Prum says. Another explanation is that these optical structures, because of their wavelength-specific reflection, protect the shade-loving S. willdenowii and other similarly iridescent understory plants from damaging exposure to UV and high-energy blue light, which these structures reflect. In fact, all known examples of iridescent leaves—found in plants as diverse as ferns, begonias, and orchids—are blue. It suggests “convergent evolution for reflecting blue light,” Whitney says. “It seems quite counterintuitive, since blue light is very important for giving plants information,” and is vital for processes such as morphogenesis, she adds. The brightest living tissues on the planet are found in fish. 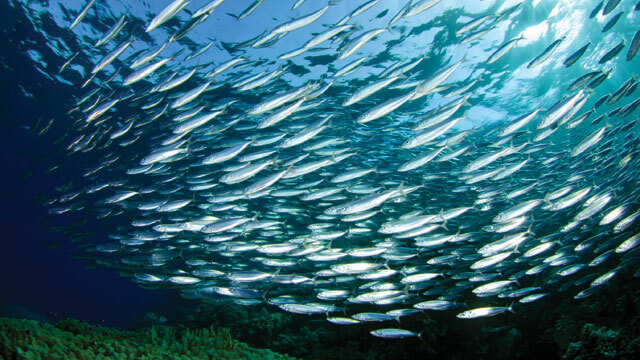 Under ideal conditions, for example, the silvery scales of the European sardine and the Atlantic herring can act like near-perfect mirrors—reflecting up to 90 percent of incoming light. It is an irony of nature that these shiniest of structures are not meant to be flaunted, but are intended as camouflage. “When you’re out in the open water, if you drop down below 10 to 30 meters, in any direction you look, the intensity of light is the same,” explains Nicholas Roberts, a physicist at the University of Bristol who specializes in bio-optics. At that depth, a perfect reflector, or mirror, would seem invisible, because light is equally reflected from all sides and angles. SHINY CAMOUFLAGE: The pearly color of the sardine Alburnus alburnus results from the interaction of light with intracellular guanine crystals in the animal’s skin.© PIET SPAANS/WIKIPEDIAThe European sardine and the Atlantic herring come close to mimicking silvery mirrors thanks to intracellular stacks of thin, flat, highly reflective crystalline plates of guanine crystals, separated by cytoplasm. These reflective cells are found on the layer of skin called the stratum argenteum, which lies immediately beneath the scales. By randomly varying the spacing between the cytoplasm and guanine-crystal layers, the fish ensure that a broad band of wavelengths is reflected, affording them a silvery, mirror-like appearance. This high reflectance is enhanced, Roberts recently found, by two types of guanine crystals present in the stratum argenteum of sardines and herring that differ in their optical properties. Specifically, the multilayer structure doesn’t polarize the reflected light, which is critical for camouflage because polarization makes a surface less reflective. A normal reflective surface, because it is not a perfect mirror, fully polarizes reflected light at a certain angle—known as its Brewster’s angle. Herring and sardines overcome this by layering two types of guanine crystals with different Brewster’s angles. The end result is that the reflected light is, for the most part, polarization-neutral. “Not polarizing the light actually gives them the ability to reflect as much light as they can,” Roberts says. “Animals underwater have taken structural colors to an extreme,” Roberts says—sometimes employing a property called dynamic iridescence. 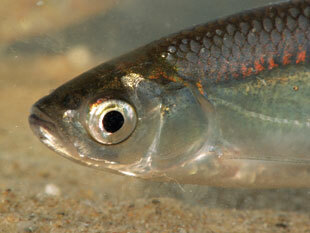 The popular freshwater aquarium fish known as the neon tetra (Paracheirodon innesi), which also produces structural colors based on guanine crystal layers, alters the color of the bright blue iridescent bands along the sides of its body in a matter of seconds when light levels change. 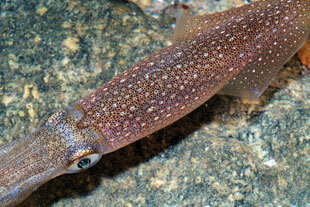 COLORS AT WILL: Atlantic longfin squid (Loligo pealei) change their skin color and pattern based on visual stimuli. 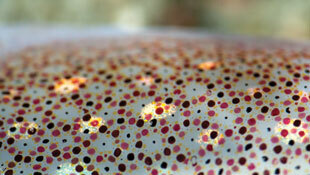 The yellow, red, and brown spots are due to pigment sacs contained inside cells known as chromatophores. Beneath the chromatophores is another layer of color cells known as iridophores. The color produced by these cells is structural and based on the arrangement of proteins called reflectins.COURTESY OF GRAYSON HANLONOne of the mechanisms proposed to explain this propensity for color shifting is that color-producing cells, called iridophores, contain photoreceptors that activate the cell’s sodium channels when exposed to light, which in turn causes the cytoplasm layers separating the thin guanine crystal plates to swell—shifting the reflected color from ultraviolet in the dark-adapted state to a bright iridescent blue in the light. Another proposed mechanism, however, suggests that photoreceptors turn on motor proteins that pull on the guanine plates and change their tilt like the slats of a Venetian blind. ATLANTIC LONGFIN SQUID (Loligo pealei)COURTESY OF GRAYSON HANLONDynamic iridescence is most strikingly exemplified by cephalopods, such as some species of squid, that can undergo dramatic and lightning-quick transformations in both their structural and pigmented coloration at will. 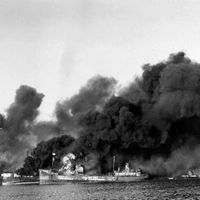 In 2004, a team of researchers led by University of Wisconsin-Madison microbiologist Margaret McFall-Ngai (then at the University of Hawaii–Manoa) discovered that the reflective material responsible for structural iridescence in cephalopods is a novel and unusual family of proteins, which they aptly named reflectins.Instead of the plates of purine crystals found in the reflective structures of many fish, the cephalopod iridophores contain multiple layers of membrane-enclosed reflectin proteins. The nervous systems of certain species, such as the longfin inshore squid (Loligo pealei), can control the reflective properties of the reflectin structures by releasing neurotransmitters that modulate the phosphorylation of reflectin. The phosphorylation is thought to affect reflectin’s solubility and thus fine-tune the spacing of the protein layers—ultimately changing the color reflected by the iridophores. To create structural colors, organisms must master architecture at the nanoscale—the size of visible-light wavelengths. “But it turns out that biology doesn’t do a good job of creating nanostructures,” Prum says. Instead, organisms create the initial conditions that allow those nanostructures to grow using self-organizing physical processes. Thus, organisms exploit what’s known as soft condensed matter physics, or “the physics of squishy stuff,” as Prum likes to call it. This relatively new field of physics deals with materials that are right at the boundaries of hard solids, liquids, and gases. MALE EASTERN BLUEBIRD (Sialia sialis) KENTHOMAS.US/WIKIMEDIA COMMONSSoft condensed matter physics has been particularly useful in understanding the production of the amorphous nanostructures that imbue the feathers of certain bird species with intensely vibrant hues. 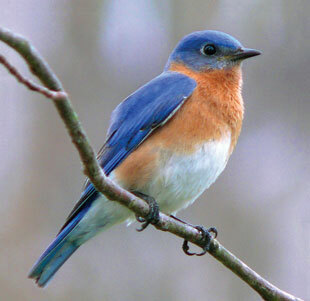 The blue color of the male Eastern bluebird (Sialia sialis), for example, is produced by the selective scattering of blue light from a complex nanostructure of b-keratin channels and air pockets in the hairlike branches called feather barbs that give the quill its lift. The size of the air pockets determines the wavelengths that are selectively amplified. When the bluebird’s feathers are developing, feather barb cells known as medullary keratinocytes expand to their boxy final shape and deposit solid keratin around the periphery of the cell—essentially turning the walled-in cells into soups of ß-keratin suspended in cytoplasm. Next, b-keratin filaments free in the cytoplasm start to bind to each other to form larger bundles. As these filaments become less water-soluble, they begin to come out of solution—a process known as phase separation—ultimately forming solid bars that surround twisted channels of cytoplasm. 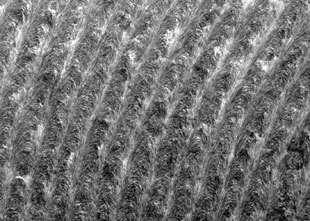 These nanoscale channels of keratin remain in place after the cytoplasm dries out and the cell dies, resulting in the nanostructures observed in the feathers of mature adults. 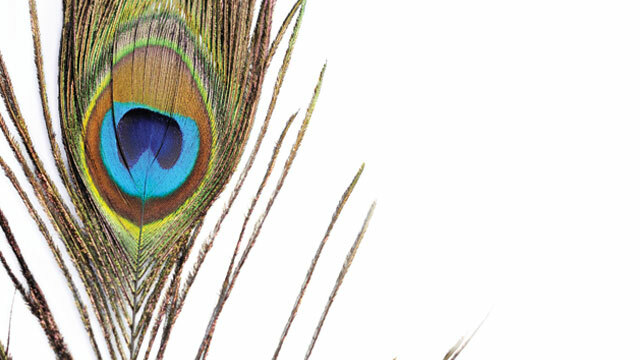 The point at which the phase separation halts determines the color each feather produces. What remains unclear, however, is exactly how the bluebird halts the phase separation during feather formation. It is a lament heard universally throughout the field of structural colors: there is an overwhelmingly poor understanding of the biological mechanisms that control and fine-tune the formation of these color-producing nanostructures. “We don’t know anything about the genetics behind structural colors,” Roberts says. Glover and her team at the University of Cambridge are currently studying the hibiscus flower, whose iridescence is produced by striations or grooves in the waxy cuticle secreted by cells in the uppermost layer of the petals, to tease out the genetic elements that control the formation of its color-producing structure. By using electron microscopy and comparative transcriptome approaches, Glover has come across telling clues that point back to a self-assembly mechanism not unlike the one that occurs in the bluebird’s feathers. “We have an idea that actually much of what we’re seeing might be the result not of any special patterning mechanism, but just of the amount of cuticle that’s made, and when it’s made relative to when the cells grow,” Glover explains. Although it has not yet been proven, Glover believes that during petal formation cells secrete a protective layer of wax, and as the cells continue to grow, mostly in one direction, they pull and stretch the waxy cuticle, forming wrinkles, grooves, and troughs—similar to those that would be observed if a sheet of cling wrap is stretched. It is a lament heard universally throughout the field of structural colors: there is an overwhelmingly poor understanding of the biological mechanisms that control and fine-tune the formation of these color-producing nanostructures. It is this natural variability in the process that makes it difficult for physicists such as Vukusic to produce theoretical models of these systems that may one day aid in the production of synthetic structural colors that rival those found in nature. “The three-dimensional nature of the structures themselves is just so complex,” says Vukusic. “Were it to be a simple periodic system with a regular geometry, you could easily put that into a computer model and run simulations all day. But the problem is that they are never perfectly periodic.” For now, it seems, nature will keep its beauty secrets to itself. A former staff member of The Scientist, Cristina Luiggi is currently a science writer based in Paris, France.